Comrades, this is intolerable. Who's side are these guys on anyway? 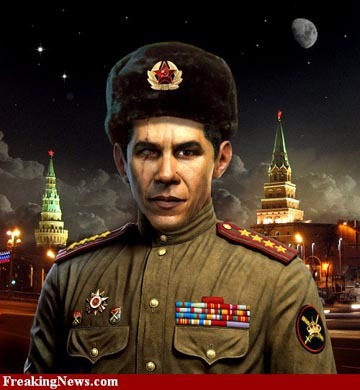 You won’t believe it, I’m sure, but Russian newspaper Pravda (yeah, the former propaganda tool of the communist party) has zero appreciation for Barack Obama. Obama, the newspaper says, is trying to bring Marxism to America - and Americans are accepting it because he “radically transforms” their country with a friendly smile on his face. If this keeps up for more then another year, and there is no sign that it will not, America at best will resemble the Wiemar Republic and at worst Zimbabwe. Obamessiah is to be commended for his aspirations to turn the USSA into the likeness of Zimbabwe! Having said that, I denounce the Nobel Committee for awarding him the prize. He is, after all, only trying to emulate me. Can the disciple be more than the master? It makes perfect sense then that I should receive the Nobel Peace Prize! Wow, not much in that article I can disagree with...how phucking sad is that, excuse the language I have been listening to the administration as of late. The Russians ought to be proud. Remember the days when we had to have front groups, to mask our true intentions. No front groups needed now, well, except for ACORN, and Move On, and Code Pink, but they are laughable compared to groups we had in the past. And, just because the Russians didn't hone our Glorious System to perfection, doesn't mean it's wrong. This time, we'll get it right, and we'll show the world that yes, we can! We can have a worker's paradise, right here in Amerika. Now, we've just got to figure out how to bring the unemployment numbers down. It's minor, comrades, a minor detail. Now, we've just got to figure out how to bring the unemployment numbers down. Just do what they do in that socialist nirvana of Sweden. Say that anyone that is on the public dole is "employed." So, if they're collecting unemployment, they're actually employed! By the government. That is brilliant! Simply brilliant. Now, we should all be so lucky. Barack Hussein Obama: Exposing His Wimp Factor? !